Driver apparently swerved to avoid slowing cars and lost control. Several of the six people in the SUV were ejected, according to the WSP. 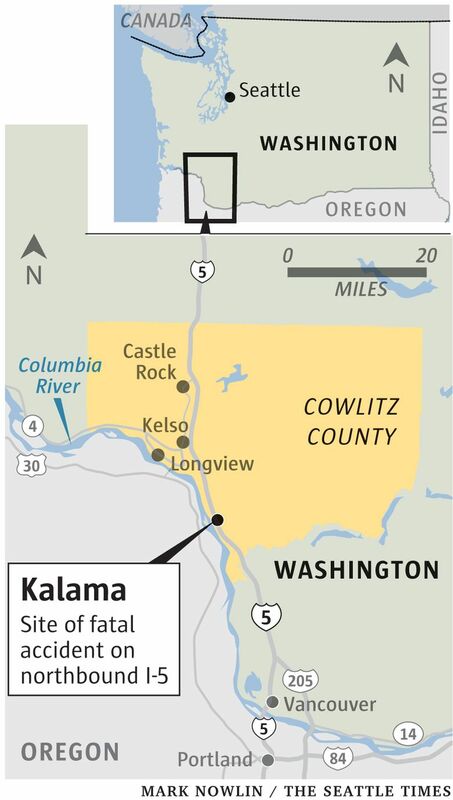 Three people were killed and three others injured, one critically, when a vehicle went off the freeway in Kalama and overturned Saturday, according to the Washington State Patrol. WSP Trooper Will Finn said the crash occurred at 4:36 p.m. in the northbound lanes of Interstate 5 at Exit 27 in Kalama. Finn said a large SUV carrying six occupants — three adults and three children — went off the roadway and overturned, rolling at least 1 ½ times before coming to rest on its roof. Five of the six SUV occupants — two adults and three children — were ejected, according to Finn. He said it’s believed that none of those five had been wearing seat belts. The first trooper who arrived tried CPR on one of the children, a 6-year-old girl, but she was pronounced dead at the scene. Two adults, the girl’s grandparents, were also dead at the scene, according to Finn. The grandparents have been identified as Oferia U. Nuusolia, 60, and Lokeni A. Nuusolia, 65, of Lakewood. Another child suffered critical injuries and was transported by LifeFlight to Randall Children’s Hospital at Legacy Emanuel in Portland. The mother of the three children and a third child were transported by ambulance to PeaceHealth St. John Medical Center in Longview. The mother was later discharged, and the child was transported via helicopter to Randall Hospital. One child was in serious condition and one child was in critical condition Sunday morning, a hospital spokeswoman said. Troopers investigating the crash believe some sort of distraction had occurred in the SUV, taking the driver’s attention away from the road just as traffic slowed. The vehicle went off the road after the driver took aggressive action to avoid the slowing vehicles.